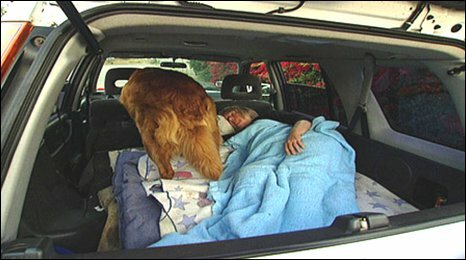 This is the latest version of Homelessness in America, as written up by the BBC. This photo shows car sleepers in California. One of the women interviewed is a former real estate agent. Car sleeping - something that is only possible in warm climes so this winter should be dreadful in some parts of the US. There is an effort afoot also to prevent those whose homes have been foreclosed on from voting. This article was sent me by Alan C in Seattle, who also indicated that Operation Nightwatch has a group working on a 'car corral' for Ballard homeless car campers. (For non-Seattle readers, Ballard is a neighborhood in Seattle.) The website is SeattleNightWatch .